Four friends have raised over £6,000 by cycling from John O’Groats to Lands End for a south west charity helping those living in poverty around the world. They undertook the gruelling challenge to fund an ongoing project in Romania for the Wiltshire-based charity People against Poverty. The organisation helps raise money through local partnerships and networks – including its own social enterprise Business Against Poverty. Ben Armstrong and Will Ford, who live in Bath, Harry Smith, from Chippenham and Billy Braithwaite, from Frome – all aged 17 – met at Prior Park College in Bath. Last year they raised money towards a school trip to Eastern Romania near the Moldavian border to help create a micro farm near the city of Iasi. The school group helped villagers build an animal barn, create vegetable patches with poly tunnels but the boys could see there was still much more work to be done. The boys pledged to go back and help again in the summer of 2016 and set about raising the money to do it. 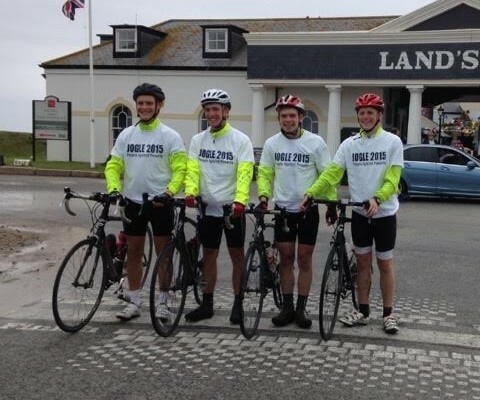 They chose the Lands End to John O’Groats route because Ben’s father had cycled it for charity five years ago. However the boys reversed the route and started in Scotland. There were challenges along the way – even finding the time to train together was an issue and before they set off they had not cycled more than 75 miles in one given day. So on day one they had the daunting task of riding 90 miles to get to their first night’s accommodation. In all, they covered 1002 miles, crashed seven times, had three punctures, one broken spoke and got through 56 doughnuts and 150 energy gels. The boys say they could not have achieved their goal without their team cars – driven by family members who were with them throughout their journey offering support and encouragement. Next Story Calling all graduates: Do you have what it takes to work for the world’s largest building society?